One of the best things about winter is that you can start dipping anything and everything in chocolate and no one will say a word. Which is exactly how this recipe came to be. 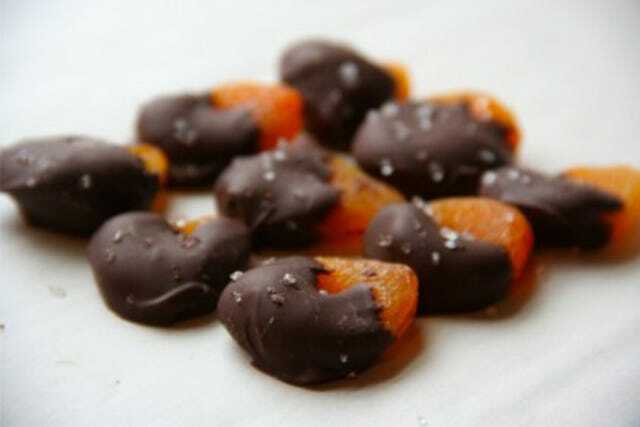 Chocolate dipped apricots have been a winter standard of a close family friend for years, mostly because they’re foolproof: Buy dried apricots, melt chocolate, dip apricots, let cool, serve, and feel successful in your culinary prowess. As I went to make these for a dinner party, I realized that I also had some almond paste (otherwise known as a more basic version of marzipan) left over from a dessert a few days before. Yes, admitting that you just happen to have almond paste on hand makes you the perfect target for eye-rolling from your friends. Make all the fun you want, but almond paste is no more complicated than putting some blanched almonds and sugar in a food processor and turning it on. There are worse things you could have on hand. With said almond paste already made, I decided to put it to use; no point in letting it go uneaten. The result was one of the easiest yet complicated-sounding recipes I have ever made. “Oh you know, there’s a layer of almond paste in there.” (Your friends will eye roll but they will also eat every last one of these). A salty layer of chocolate — because you should always add sea salt — followed by the taste of sweet almond. It’s the perfect blend of flavors. The original recipe is good, and if you don’t want to make the almond paste, have at it, but this revamped one is even better. Form almond paste around half of each apricot. The almond paste molds easily, just make sure it’s packed tightly onto the apricot. Melt the chocolate and flaky sea salt slowly, either in the microwave, a double boiler or the heat-proof bowl inside of a pot of warm water solution. 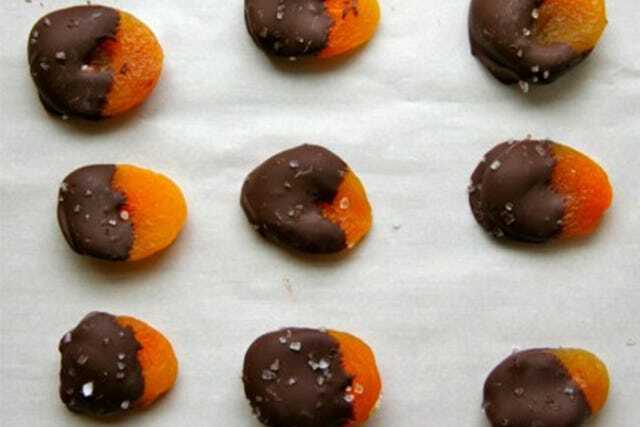 Dip the apricots into the chocolate so that the almond paste is entirely covered. Place on parchment paper and sprinkle with coarse sea salt. Once cool, store in an airtight container. If you happen to have leftover almond paste and melted chocolate, put that almond paste on the parchment paper, pour chocolate over, and once it cools, eat it up before anyone else catches you. NEXT: Are Americans Destined to Eat Bad Food?